Football is the answer to all our problems.Don’t laugh, I’m serious. Now I’m not just talking about sports in general but this specific one. I will concede that all sports, well most sports, have merit. It is good to learn that sometimes you win, and sometimes you lose. Winning takes work, or luck, or a weaker opponent. Sometimes you just aren’t good enough, sometimes the referee robs you, and sometimes you are just unprepared. There are rules. If you choose to disobey the rules penalties are enforced, unless they don’t catch you, but someone always notices. Sports are proactive, or reactive, but always active. Doing is required. You have to play. There are those who watch, and they are often loud and always have an opinion, but someone has to play. All these things apply to sport and life. These merits have made room in our academic institutions and our children’s schedules. Long live sports! But if I was told all sports must go but one, I would need no time for deliberation. The answer is clear. If I had to choose one sport with which to instruct our youth, one sport with the most to offer, one sport with which to craft our world, it would be Football! First, before you start, I’ll address the violence. Yes, football is rough, so is life. I am not fundamentally against spanking kids, but I’m doing everything I can not to. It is hard not to because I know that sometimes a quick smack in the mouth teaches a lesson quicker than a sermon, 5 time outs, and forfeited toys. The problem is I don’t want my children associating smacks in the mouth with me. That’s what is great about football. There are strict rules governing the use of violence. There is room to exert it with everything you have, but only while in control. When you lose control there are the most severe of penalties… you get thrown out of the game. There are pads to protect the player. In a violent sport there must be some sort of protection but pads also change the game. What my rugby playing brothers don’t understand is that football pads are covered in plastic and metal. Plastic and metal are much harder than muscle and bone. Pads allow a player to play past the usual physical limitations. Without pads a player could not run full speed directly into another player, who is also running directly at him, exploding into the contact rather than bracing for it. The pads remove hesitation and fear, allowing the player to give it their all without inhibitions. The result is much more explosive collisions, more intensity, and more violence. Laws, family, and society work as pads for life. All can both protect us and change the nature of the game we are playing. The more padding life or society gives us, the harder we can play without fear of pain or penalty. If we abuse this padding the consequences are also amplified. Football, more than any other sport, must be coached. Someone is calling the plays, directing the game, orchestrating the whole show. Every play is choreographed. There are so many moving parts that must work in concert with each other, that the one moving the chess pieces must be heeded. A player must learn to take instruction, feedback, and criticism, not only in daily practices but during the heat of battle as well. Player and coach must learn to communicate and wills must bend. Someone must lead and someone must call the shots. A player who wants to play must learn that performance gets the coaches attention. If a player wants to get noticed, wants to contribute, they must gain the coaches favor. Some coaches judge solely on skill and performance, others on personality and family. A player must learn that if the coach is running the show, the player must accommodate. Most all programs have multiple coaches. A player must learn to listen to different coaches and use these coaches as advocates in their favor with the head coach. Each individual must not only perform individually, but gain favor of layers of others, be they teammates or coaches, and at the end of it, all must work together to win. Society works the same way. Jobs, governments, neighborhoods, and families all possess layers of hierarchy and networks that must be maneuvered and navigated. Unlike basketball, baseball, or even hockey, no one player can completely dominate a game. There is no real Michael Jordan or Tiger Woods of football. In basketball all players are more or less doing the same activities, dribbling, passing, shooting, defending. Some may perform these tasks with slightly different roles but essentially a center and a guard are both dribbling, passing, shooting, and defending. There are some players who do all these things so well they can render the rest of the team secondary or even inconsequential. A pitcher can throw a no-hitter. A goalie can amazingly shut down an entire team… not in football. Each position in football has a unique purpose, and all must be done well to have success. A quarterback is useless without good lineman, and the two positions are absolutely nothing alike. Receivers and linebackers are nothing alike but both are essential. The different positions are so varied that they require players with a staggeringly wide range of skills and abilities. Some positions require obscene size and strength, others speed and agility. Some take aggression and reaction, others vision and cunning. To win a team and its players must learn to perform individual tasks while also relying on others to simultaneously perform completely different tasks. You must balance individual responsibility and trust in others, as well as a system. A player must learn to trust someone who is nothing like them; doing things they can in no way do themselves. Leaders may emerge and weaknesses may become apparent, but to win all must adjust and work together. This lesson, above all else, can make the world a better place. We must not all be alike in the world, nor should we be. Difference is good, even essential. The key is learning to appreciate that no one position, or person, can do without the other and all are important. As long as we are all on the same team. We perform our roles with varying levels of success, while others do the same. We win, we lose, and our actions have consequences for both ourselves and others. The way we play in life has rewards and sometimes pain. How much better prepared is a person, or a society, that has practiced living while young, before it really matters? How much better prepared is someone who has learned what it takes to win, or lost and still got up to play again? Our world and our society are fraught with problems. We have racism, starvation, greed, and selfishness. Irresponsibility, laziness, nepotism, and politics are everywhere. Great post. I can’t wait for this lockout to end so I can get football back. Oh football isnt gone… just drive by your local park come August and watch all the little people. Well, quite so. I think the playing – active – part is the key. I’ve thought the same things many times in the past (although admittedly not about American football). Baden Powell thought that rock climbing was the best metaphor for life. The Victorians thought it was fox hunting. I’m rather partial to cricket in that sense. In any case, there is certainly enormous value in sport. It’s only the professional kind that continually sticks in my craw. Once again, an awesome post! 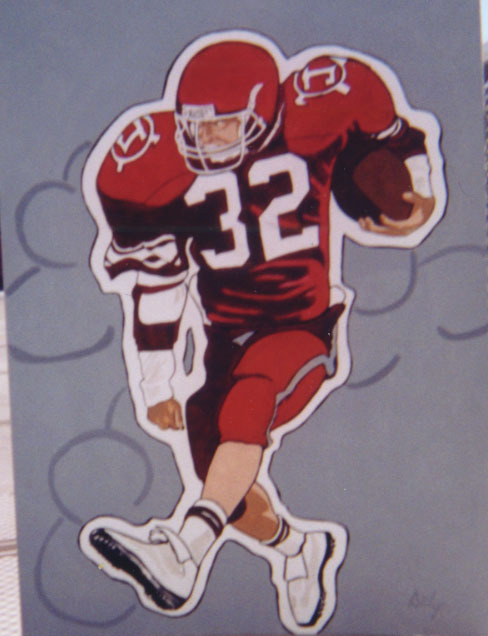 To this day I still wish my mom had let me play…go Utes! Good stuff. I’d be curious to see you do a rugby and american football post one of these days. I just wish that the big money and “hit to kill” mentality was taken out. Give me The Army-Navy Game any day. Seniors are about to deploy, not sign a multi-million dollar contract. Guts, Glory and School Pride, that’s what the game should be about. I agree, watch the school kids. Well said! Bring on football, indeed. Thanks for making me aware of this post when you stopped by my blog today. I’m sooo ready for football season (and the cooler weather that comes with it).